Southwest Airlines just introduced a new coffee to its onboard menu that has some perks beyond the usual caffeine pick-me-up. The LIFT coffee is a dark-roasted Arabica blend and is served in eco-friendly cups made from post-consumer recycled materials. The cups have built-in sleeves to make them easier to handle when filled with hot coffee. The coffee will be available free of charger to airline passengers, but for every cup served, Southwest will make a donation to the Guatemala Light Project, a charity which brings electricity (i.e. light) into the rural coffee-growing regions of Guatemala via solar powered LED lighting systems. The coffee blend was only introduced on May 4th, but is already getting positive reviews from flyers. 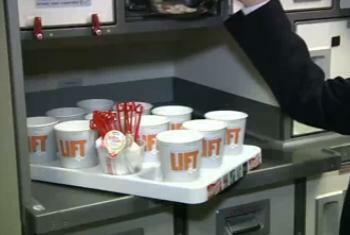 Southwest is also serving Coffeemate liquid creamers, instead of the powdered creamer they used to have.